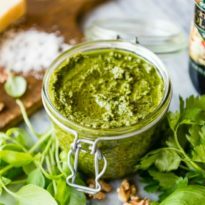 This Basil Walnut Pesto recipe comes together in 15 minutes with just 6 ingredients. Great for pasta, sandwich spreads, and garnishing soups! Toast the garlic cloves in their skin in a small skillet over medium heat, shaking often, until brown spots form, about 5 minutes. Remove to a small bowl to cool before peeling. Meanwhile, return the skillet to medium heat and add walnuts. Toast until fragrant, 5 to 10 minutes, shaking frequently to prevent scorching. Remove from heat. Combine peeled garlic, walnuts, basil, parsley, parmesan cheese, and olive oil in a blender or food processor; blend until smooth. Season to taste with salt and pepper. Serve as a topping on pasta (3/4 c. pesto per pound of pasta), as a spread on sandwiches, or as a garnish to soups. Toast the garlic and the walnuts is optional but recommended. If skipping these steps, peeling the garlic before adding to the food processor in Step 3.